The beloved print Horses and Apples, pictured below, is now retired. This oh so sweet puppy print was the inspiration behind the set. 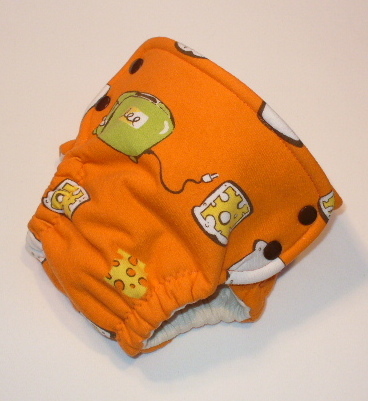 A Stinky Couture side snap fitted cloth diaper complimented by an Ann Claire Petit hand made designer pooch. The set has since been a favorite though the puppy print will soon be retired. Cheese Toast …oh so yummy! We are currently working on the details of the upcoming photo contest. However, do start taking your pictures. We do so love to see your sweet babies in Stinky Couture™! Pictures should be sent to stinkycouture at yahoo.com, once received photos become the property of Stinky Couture™. By submitting your picture, you authorize that the photograph may be displayed on the Stinky Couture™ website, blog and or Flickr without any fee or other form of compensation. As well you agree that Stinky Couture™ may make and retain copies of the photograph for archival purposes. Official details will be posted. 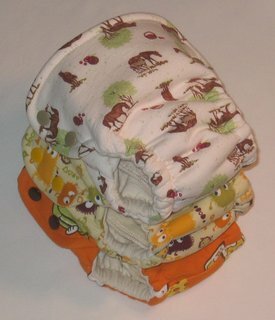 Winner of the photo contest will receive a FREE YPS (you pick size) fitted diaper from Stinky Couture™!